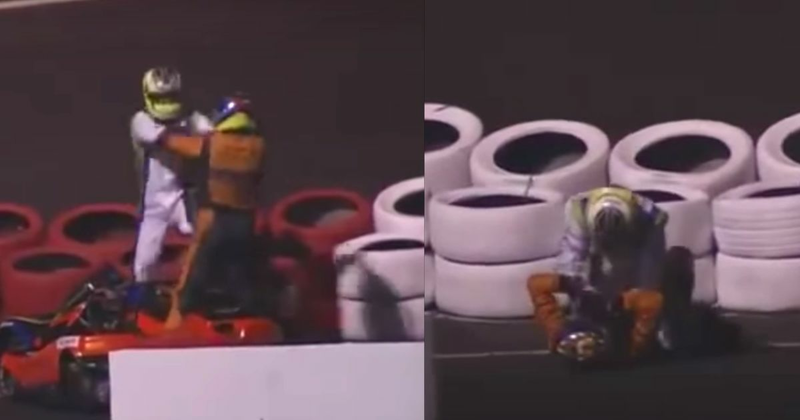 With just 18-laps to go in the 500 Milhas karting race in Brazil, second-place Tuka Rocha punted out backmarker Rodrigo Dantas, who had been holding up Rocha whilst teammate Felipe Massa pulled out a lead. But things got even worse after the accident as Rocha and Dantas ended up brawling on the circuit - and not just your ordinary bit of pushing and shoving, either. Dantas repeatedly battered Rocha in the helmet and then looked like he was starting to choke him. Felipe said he was “saddened” by the events and added, “I have never seen anything like it in my career”. With the disqualification of his team the win went to a squad including another ex-F1 driver - Rubens Barrichello.